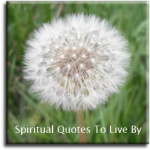 This collection of 100 Spiritual Quotes To Live By are gathered from different pages on this site. There are positive and inspirational quotes on Angels, Attitude, Law Of Attraction, Life, Love, Nature, Peace, Self, Soul, Spirit and Wisdom. 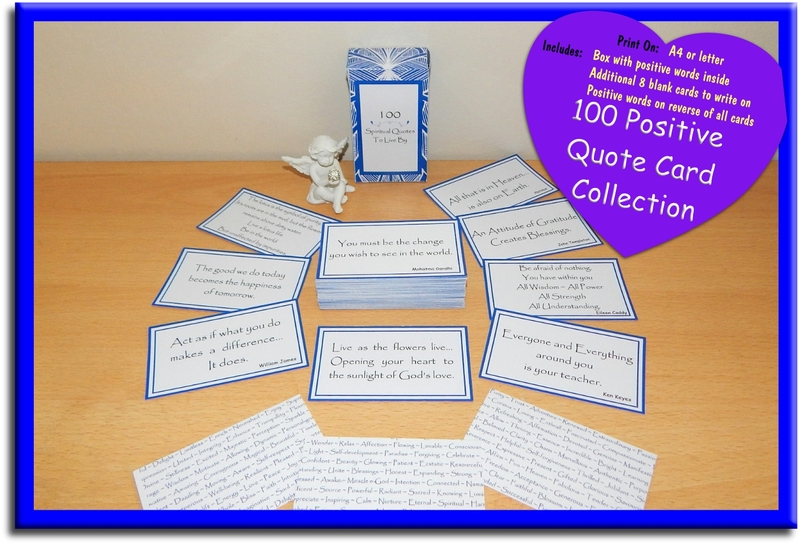 They are listed in order of the author's surname with the quotes from unknown authors at the end. 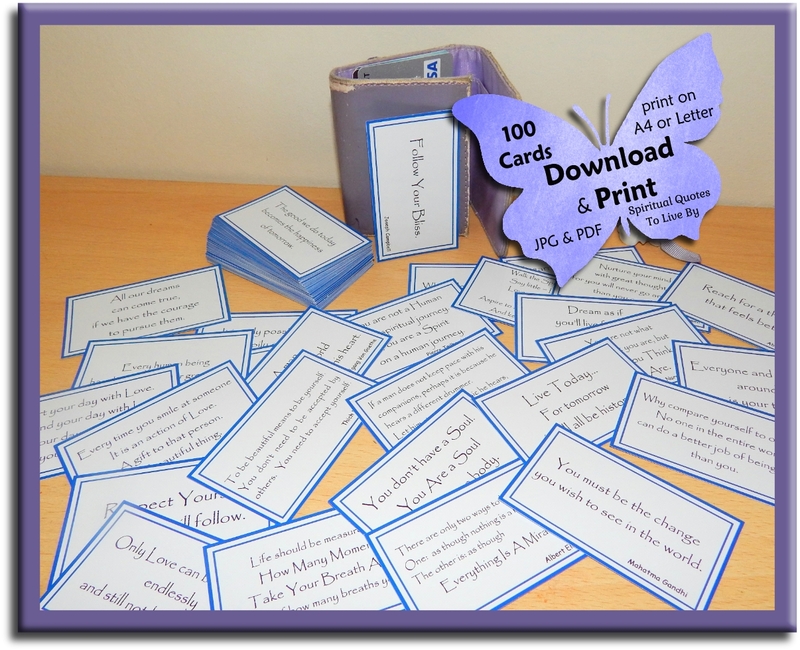 This collection is available to download and print as small quote cards (as in picture) from my SpiritualQuotesTLB Etsy shop. 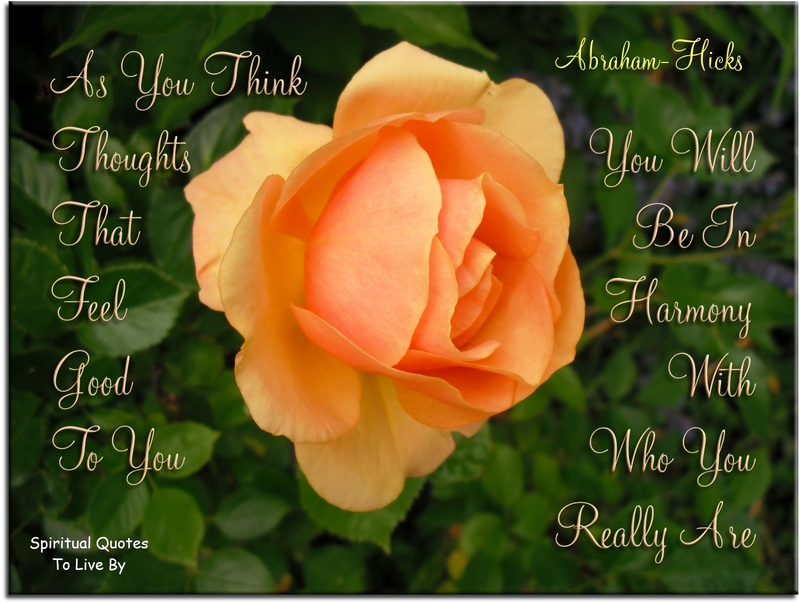 As you think thoughts that feel good to you, you will be in harmony with who you really are. Reach for a better feeling thought. The standard of success in life isn’t the things. It isn’t the money or the stuff. It is absolutely the amount of joy that you feel. Everything I do and say with anyone, makes a difference. Every human being has the potential for greatness. The storms of life no more indicate the absence of God, than clouds indicate the absence of the sun. It is only possible to live happily ever after on a day to day basis. There is no way to happiness..
Be afraid of nothing, you have within you: all wisdom, all power, all strength, all understanding. Dwell not on the past, use it to illustrate a point then leave it behind. Nothing really matters except what you do now, in this moment of time. From this moment onward you can be an entirely different person, filled with love and understanding, ready with an outstretched hand, uplifted and positive in every thought and deed. 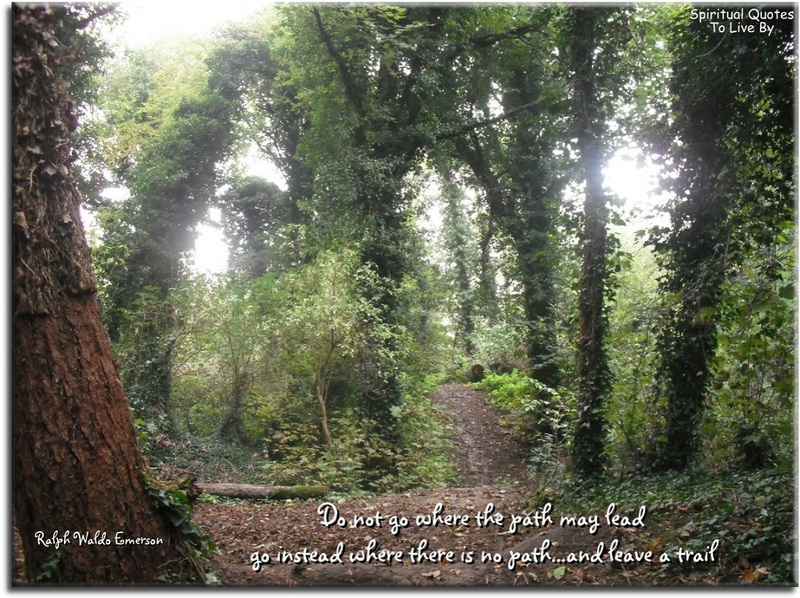 You are not a human on a spiritual journey. You are a Spirit on a human journey. Go with all your heart. It is the key that fits the lock of everybody’s heart. 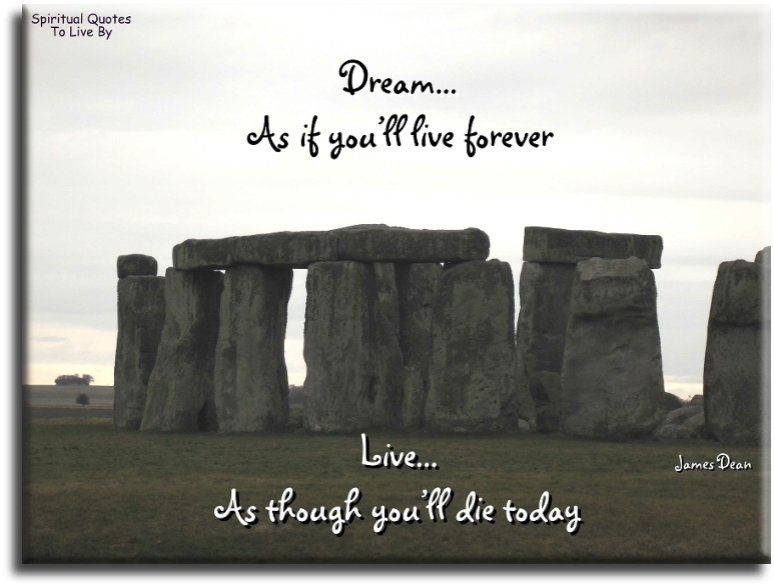 Dream as if you’ll live forever. Live as if you’ll die today. 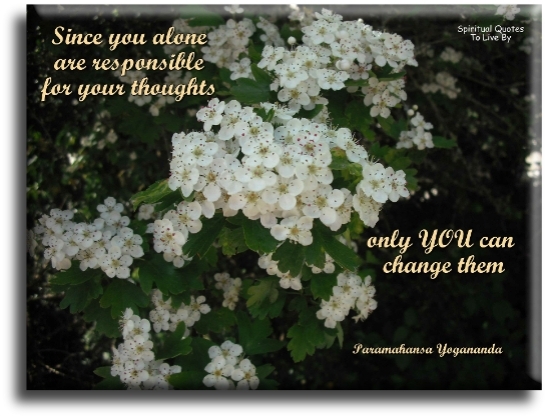 Nurture your mind with great thoughts, for you will never go any higher than you think. Everyone on this planet has Spirit within them as an all powerful force for good. I am a reflection of my Source.. Which is magnificent in all ways. Most people search for happiness outside of themselves. That’s a fundamental mistake. Happiness is something you ARE, and it comes from the way you think. On your daily journeys, listen to those inner signals that help you make the right choices, no matter what anyone thinks. Once you believe in yourself and see your Soul as Divine and precious, you will automatically become a being who can create success. Radiate an energy of serenity and peace, so that you have an uplifting effect on those you come into contact with. There’s always something beautiful to be experienced wherever you are. Right now, look around you and select beauty as your focus. You are unique in all the world. Outer changes always begin with an inner change of attitude. 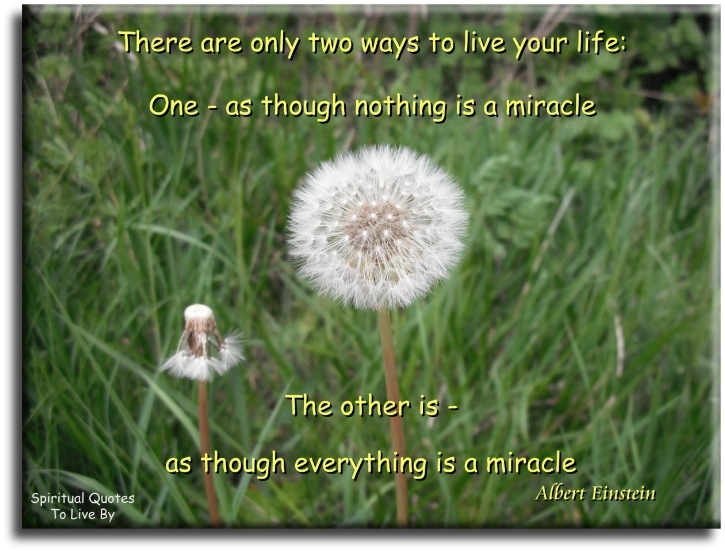 There are only two ways to live your life.. One, as though nothing is a miracle. The other is, as though everything is a miracle. The meaning of things lies not in the things themselves, but in our attitude towards them. Whether you think you can, or think you can’t.. The minute you speak to your angel for the first time, you will never be alone again, because our angels are always with us. No matter where you are as you read this, you are surrounded by angels. Your room, your office, your garden - are filled with angelic presences. You must be the change you wish to see in the world. Every moment of your life is infinitely creative, and the Universe is endlessly bountiful. Just put forth a clear enough request, and everything your heart desires must come to you. A man sees in the world, what he carries in his heart. At any moment, you have a choice that leads you closer to your Spirit, or, further away from it. It is possible to live twenty-four hours a day in a state of love. Every moment, every glance, every thought and every word, can be infused with love. The most precious gift we can offer anyone is our attention. When mindfulness embraces those we love, they will bloom like flowers. To be beautiful means to be yourself. You don’t need to be accepted by others. You need to accept yourself. When we create peace, harmony and balance in our minds, we will find it in our lives. The Soul, like the body, lives by what it feeds on. If we look at the world with a love of life, the world will reveal its beauty to us. 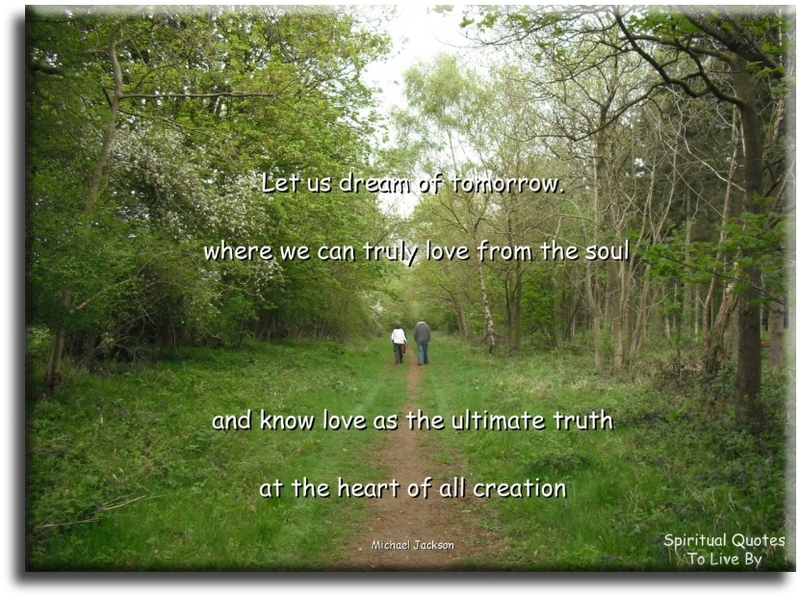 Let us dream of tomorrow, where we can truly love from the Soul, and know love as the ultimate truth at the heart of all creation. Act as if what you do makes a difference.. The shoe that fits one person pinches another. There is no recipe for living that suits all cases. Your vision will become clearer only when you look into your heart. Everyone and everything around you is your teacher. Beauty and inspiration can be found in any natural place of the Earth. Everybody needs time to reflect and contemplate, and the most inspirational and peaceful place to do so is in nature. You don’t have a Soul. You ARE a Soul.. You have a body. Only love can be divided endlessly and not be diminished. You should never feel lonely, neglected, fearful, or defeated when you remember that there are shining ones. They are watching with keen interest and a great desire to help to raise you, to stimulate you into contact with your own superior inner resources. You are not what you think you are. But, what you think.. You are. All that is in Heaven is also on Earth. 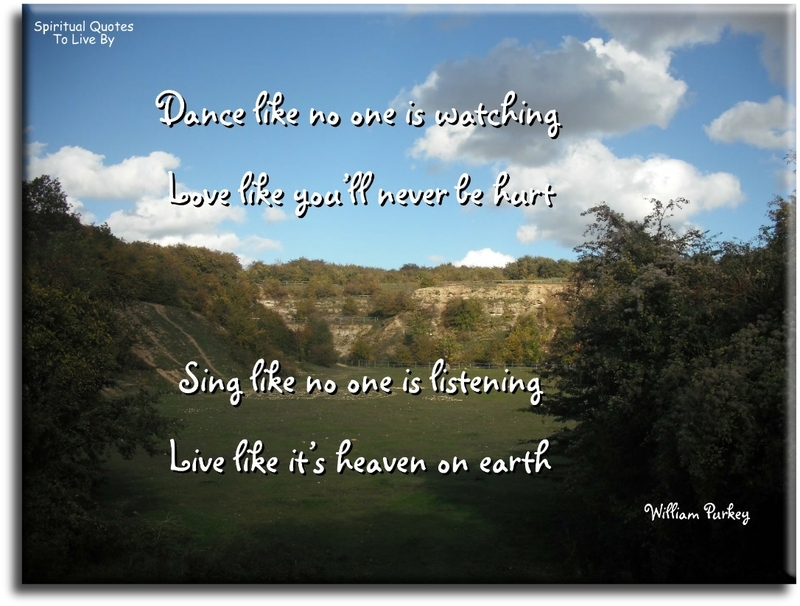 Dance like no one is watching. Love like you’ll never be hurt. Don’t try to force anything. Let life be a deep let-go. See God opening millions of flower everyday without forcing the buds. Let yourself be silently drawn by the stronger pull of what you really love. Look to this day for it is life, the very life of life. In its brief course lies all the realities and varieties of existence. The bliss of growth, the splendour of action, the glory of power. For yesterday is but a dream, and tomorrow is only a vision. If you love what you are doing, you will be successful. We are but a thread in the web of life. Whatever we do to the web, we do to ourselves. All things are bound together, all things are connected. Look on everything as though you were seeing it either for the first or last time. Then your time on Earth will be filled with glory. Don’t judge each day by the harvest you reap, but by the seeds you plant. To know what you prefer, instead of saying Amen to what the world tell you, you ought to prefer, is to have kept your Soul alive. An attitude of gratitude creates Blessings. Every time you smile at someone, it is an action of love, a gift to that person, a beautiful thing. If a man does not keep pace with his companions, perhaps it is because he hears a different drummer. Let him step to the music he hears, however measured or far away. I become what I might be. The purpose of life is to know yourself, create yourself, experience yourself as who you really are. There is no other reason to do anything. The Soul speaks to you in feelings. Watch nature, because it is your greatest teacher. It moves and flows and moves on again. There is an incredible beauty out there in the mountains, in the forests, to teach you its silence, its beauty, its humility. Stay aligned to that. only you can change them. All our dreams can come true… if we have the courage to pursue them. Within me. As me. Through me. All that I Am, All that I have and All that I circulate. Happiness is not a destination, it is a method of life. I believe that the power behind me is greater than the task ahead. I have the power within to create a Heaven on Earth for myself and to radiate a piece of that Heaven to everyone whose life touches mine. 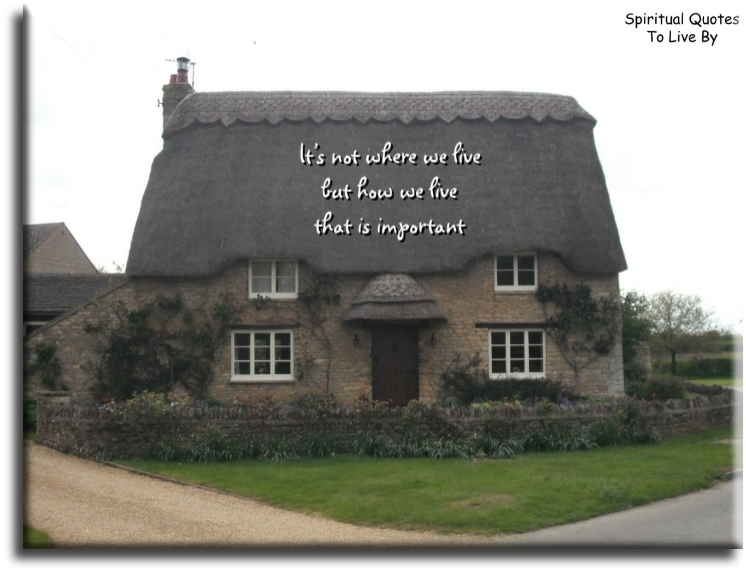 It is not where we live… but, HOW we live that is important. Life isn’t about waiting for the storm to pass..
It’s about singing in the rain. Life should be measured by how many moments take your breath away, instead of how many breaths you take. Live as the flowers live.. Opening your heart to the sunlight of God’s Love. 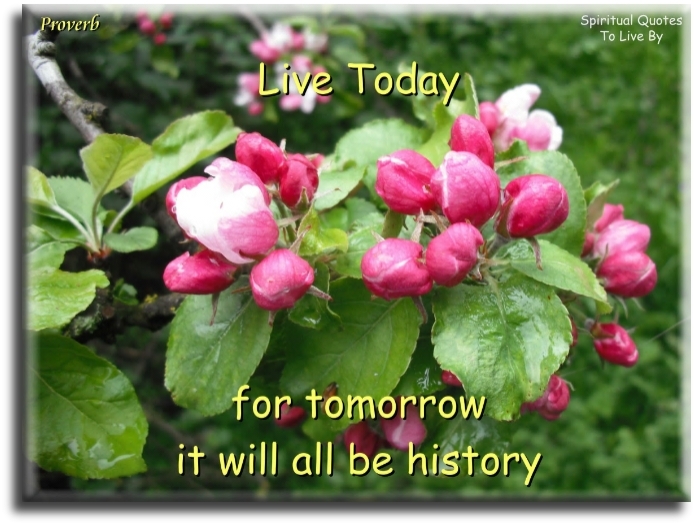 Live today… for tomorrow it will all be history. Love is universal.. It has no limits. 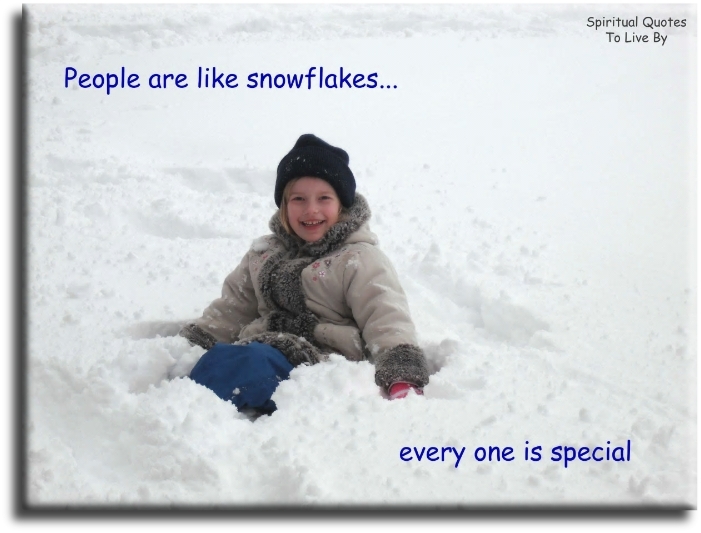 People are like snowflakes… Every One is special. Realise that you cannot help a Soul unless that Soul really wants help and is ready to be helped. Send that Soul nothing but love and more love. Be still.. And wait. But, be there when that Soul turns for help. Respect all life.. For all is of God. Seek always for the answers within. Be not influenced by those around you, by their words, thoughts and actions. Start your day with love. Spend your day with love. Fill your day with love. End your day with love. The beauty of all things.. Lies in my ability to appreciate them. The good we do today becomes the happiness of tomorrow. The lotus is the symbol of purity. Its roots are in the mud, but the flower remains above dirty water. Live a lotus life.. Be in the world, but unaffected by impurities. 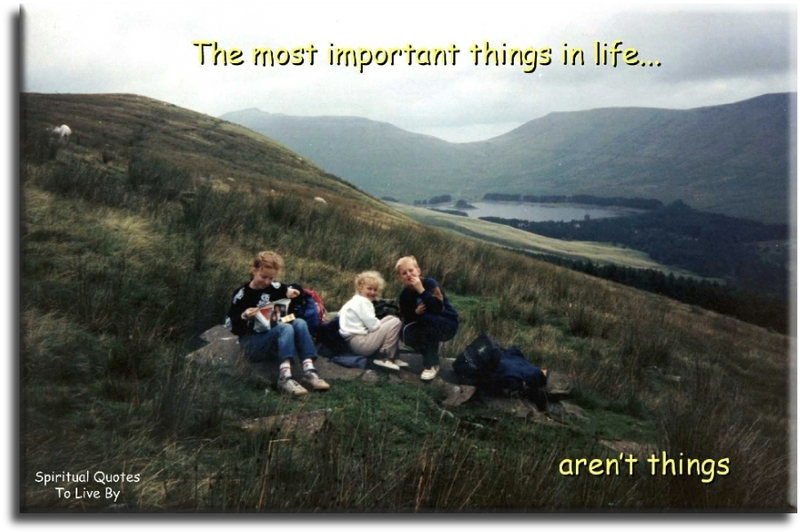 The most important things in life… aren’t things. The only way to gain respect is.. Firstly to give it. Aspire to all that is Pure and Good. And keep on keeping on. What I experience now… is a result of my past. What I experience in the future… depends on what I do now. What you think of yourself is much more important than what others think of you. When the world becomes like a wild storm.. The most beautiful shelter is God. When you believe in yourself, your world will open up to you and you will find your path. Why compare yourself to others? No one in the entire world can do a better job of being you, than you. What Would Love Do Now?